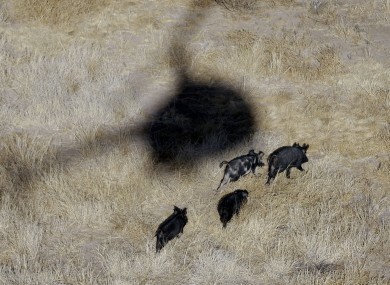 A helicopter hovers over feral pigs near Mertzon, Texas. THE STATE OF Oklahoma in the US could soon join Louisiana and Texas in allowing hunters to shoot feral hogs from helicopters. The Tulsa World reports that aerial gunners are already used to help control feral swine in Oklahoma. But that work can only be done by trained, licensed contractors with support from the Oklahoma Department of Agriculture Food and Forestry. Lawmakers in the US state are considering a bill to expand the law to private operations. Under the proposal, private landowners, companies and pilots would have to apply for a state license and be responsible for the activity. But hunters on board the aircraft wouldn’t need a license, nor would they have to provide their names to the state. The agriculture department says its agents killed more than 11,200 feral hogs, mostly by air, last year. Email “Oklahoma residents armed with machine guns to be allowed hunt pigs from helicopters ”. Feedback on “Oklahoma residents armed with machine guns to be allowed hunt pigs from helicopters ”.